On 27 March 2011, B-1B Lancer bombers from the 28th Bomb Wing at Ellsworth, South Dakota were launched to strike targets in Libya in support of Operation Odyssey Dawn. The mission marked the first time B-1B Lancers had been launched from the continental United States to strike targets overseas. The B-1B is a modified B-1A with major revisions in offensive avionics, defensive avionics, weapon payload, range, and speed. These modifications were made to incorporate certain technological advances that had occurred between the original B-lA contract award in 1970 and the LRCA competition in 1980. Improvements consist primarily of off-the-shelf technology such as a new radar, new generation computers, expanded ECM capabilities, reduced RCS, and avionics compatibility with the ALCM. The wing sweep is restricted to 60 which limits the maximum speed to just above supersonic. Rockwell also estimated range increases for the modified B-1. Differences between the B-1B and its predecessor, the B-1A of the 1970s, are subtle, yet significant. Externally, only a simplified engine inlet, modified over-wing fairing and relocated pilot tubes are noticeable. Other less-evident changes include a window for the offensive and defensive systems officers' station and engine housing modifications that reduces radar exposure. The B-1B was structurally redesigned to increase its gross takeoff weight from 395,000 to 477,000 pounds (177,750 to 214,650 kilograms). Still, the empty weight of the B-1B is but 3 percent greater than that of the B-1A. This added takeoff weight capacity, in addition to a movable bulkhead between the forward and intermediate weapons bay, allows the B-1B to carry a wide variety of nuclear and conventional munitions. The most significant changes, however, are in the avionics, with low-radar cross-section, automatic terrain-following high-speed penetration, and precise weapons delivery. Prior to 1994 B-1B fleet had never achieved its objective of having a 75-percent mission capable rate. In 1992 and 1993 the B-1B mission capable rate averaged about 57 percent. According to the Air Force, a primary reason for the low mission capable rate was the level of funding provided to support the B-1B logistics support system. Concerned about the low mission capable rate, a history of B-1B problems, and the Air Force's plans to spend $2.4 billion modifying the B-1B to become a conventional bomber, the Congress directed the Air Force to conduct an Operational Readiness Assessment (ORA) from June 1, 1994, through November 30, 1994. The purpose of the ORA was to determine whether one B-1B wing was capable of achieving and maintaining its planned 75-percent operational readiness rate for a period of 6 months, if provided the full complement of spare parts, maintenance equipment and manpower, and logistic support equipment. During the ORA the test unit achieved an 84.3-percent mission capable rate during the test period. The ORA demonstrated that, given a full complement of spare parts, equipment, and manpower, the Air Force could achieve and sustain a 75-percent mission capable rate for the B-1B. The Air Force projects that the entire B-1B fleet will reach a 75-percent mission capable rate by 2000 by virtue of numerous on-going and future reliability, maintainability, and management initiatives. However, as of mid-October 1999 the Air Force wide mission capable rate of the B-1 had fallen to 51.1 percent -- mainly because of maintenance problems and a shortage of parts. Over the previous 12 months, the Kansas Guard had maintained a mission capable rate of 71.1 percent for the 10 usable aircraft assigned to it. Overall, the B-1B had mission capable rates of 51 percent to 62 percent in FY'00 and FY'01, below the goal of 75-percent. The basis for the projection of useful life of the B-1 is the Aircraft Structural Integrity Program (ASIP). The useful life of the structure is assumed to be the point at which it is more economical to replace the aircraft than to continue structural modifications and repairs necessary to perform the mission. 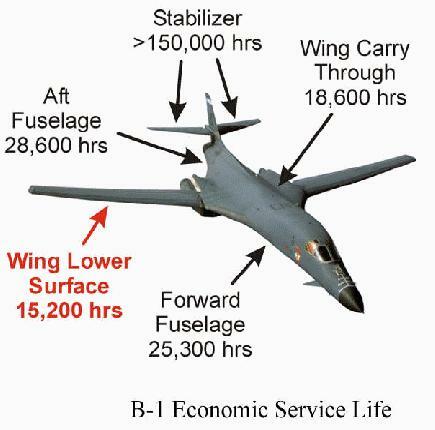 The limiting factor for B-1's service life is the wing lower surface. At 15,200 hours, based on continued low level usage, the wing's lower skin will need replacement. Current usage rates, operational procedures, and mishap attrition will place the inventory below the requirement of 89 aircraft in 2018, while the service life attrition will impact around 2038. The first B-1B, 83-0065, The Star of Abilene, was delivered to the Air Force at Dyess Air Force Base, Texas, in June 1985, with initial operational capability on Oct. 1, 1986. The 100th and final B-1B was delivered May 2, 1988. The Air Force chose to fully fund the operation of only 60 B-1Bs in the mid-1990s, compared with plans to fund 82 beyond fiscal year 2000. In the short term, the Air Force classified 27 of 95 B-1Bs as "reconstitution aircraft." These aircraft were not funded for flying hours and lacked aircrews, but they are based with B-1B units, flown on a regular basis, maintained like other B-1Bs, and modified with the rest of the fleet. B-1B units used flying hours and aircrews that were based on 60 operational aircraft to rotate both the operational aircraft and the reconstitution aircraft through its peacetime flying schedule. These 27 aircraft were maintained in reconstitution reserve status until the completion of smart conventional munition upgrades. By that time [around the year 2000], there were 95 aircraft providing an operational force of 82 fully modified B-1s. The B-1 will complete its buy back of attrition reserve by the fourth quarter of FY03, and re-code six training aircraft to attain 70 combat-coded aircraft by the fourth quarter of FY04. During the Cold War, heavy bombers were used primarily for nuclear deterrence and were operated solely by the active duty Air Force. According to the Air Force, the National Guard's part-time workforce was incompatible with the bombers' nuclear mission because of a requirement for continuously monitoring all personnel directly involved with nuclear weapons. With the end of the Cold War and increased emphasis on the bombers' conventional mission, the Air Force initiated efforts to integrate Guard and reserve units into the bomber force. As part of its total force policy, the Air Force assigned B-1B aircraft to the National Guard. Heavy bombers entered the Air Guard's inventory for the first time in 1994 with a total of 14 B-1Bs programmed by the end of fiscal year FY 1997 for two units, the 184th Bomb Wing (BW), Kansas, and the 116th BW, Georgia. The 184th completed its conversion in FY 1996 at McConnell Air Force Base (AFB), Kansas. After a long political struggle that involved resisting the planned conversion from F-15s and an associated move from Dobbins AFB near Atlanta to Robins AFB near Macon, the 116th began its conversion on 1 April 1996. The unit completed that process in December 1998. All the bombers in both units were configured for conventional, not nuclear, missions. Prior to 1994, the B-1B fleet operated out of four bases: Dyess Air Force Base, Texas; Ellsworth Air Force Base, South Dakota; McConnell Air Force Base, Kansas; and Grand Forks Air Force Base, North Dakota. In 1994, the Air Force realigned the B-1B fleet by closing the Grand Forks Air Force Base and transferring the aircraft at McConnell Air Force Base to the Air National Guard. With the transfer, the B-1B support structure, including spare parts, was distributed to the two remaining main operating bases. The concentration of aircraft and repair facilities at Dyess and Ellsworth Air Force Bases resulted in improved support capabilities, which improved mission capable [MC] rates. On 26 March 1996 it was announced that the 77th Bomb Squadron would return to Ellsworth. On 1 April 97, the squadron again activated at Ellsworth as the geographically separated 34th Bomb Squadron completed its transfer to its home at the 366th Wing, Mountain Home AFB, Idaho. By June 1998, the 77th had six of its B-1Bs out of the reconstitution reserve. This number ballanced those lost by the 34th BS.